VIDEO_TS directory is the major component of DVD video. In a VIDEO_TS folder, VOB files contain primary data, including video, audio, subtitles, menus and other video-related data; IFO files store control information to navigate a DVD player to play DVD content properly, such as chapters, audio/subtitle streams and so on; and BUP files are used as copies of IFO files in case some IFO files are corrupted. VIDEO_TS folder can be opened on hard drive after inserting a DVD into computer. DVD player software allows you to view the content. However, it is unplayable on a device and non editable unless you can make a digital copy from the whole folder. Here, we will introduce an easy and fast way to convert VIDEO_TS to AVI for better playback, editing and online uploading. WinX DVD Ripper Platinum stands out as the best VIDEO_TS to AVI converter. As a professional DVD ripper with over 10 years’ development, it can well digitize DVD disc, DVD folder (VIDEO_TS) and ISO image into various video formats. WinX DVD Ripper Platinum has a pleasing interface without confusing design. Only 3 steps, load DVD > select output > run and you can get a desired resulting file. It boasts the support of virtually all VIDEO_TS folder no matter whether it is encrypted. Generally, commercial DVD distributors use copy protections like CSS, region code, RCE, Sony ArccOS, Disney DRM or some other complex schemes on discs for preventing people from copying the content. WinX DVD Ripper Platinum utilizes hardware acceleration to produce a superfast pith WinX, you can remove all those encryptions and convert VIDEO_TS folder to AVI encoded with Divx or Xvid and other popular formats like MP4, MKV, MOV, FLV, 3GP. erformance. It makes full use of Intel QSV and NVIDIA NVENC to make GPUs to process conversion task with accelerated speed while CPU is freed up to manage other tasks. In addition, this VIDEO_TS to AVI converter can output an AVI file maintaining almost lossless quality. Free download and install WinX DVD Ripper Platinum on your computer. Next, follow the tutorial to convert whole VIDEO_TS folder to a single AVI file. Step 1. Insert a DVD disc into DVD drive. Launch WinX DVD Ripper Platinum and click +Folder button. A dialogue box appears asking you to select the DVD folder. Click Browse button to import VIDEO_TS and click OK. Step 2. After the folder is loaded, all titles included in VIDEO_TS will be listed. WinX DVD Ripper Platinum will automatically detect the main title and select it. Meanwhile, Output Profile window pops up. Find PC General Video from category and select AVI Video as output format. There are two profiles: AVI Video (Divx/Xvid +MP3) and AVI Video (Divx/Xvid+AC3/DTS). If you try to keep original audio tracks, the later profile is better. Next, click OK. Tip: Hundreds of output profiles are divided into multiple categories including General Profiles, DVD Backup Profile, Device Profile, Web Video Profile, to Music and more allowing you to convert VIDEO_TS folder to a matching format for playback, editing or uploading. Step 3. Click Browse button to set a destination folder if necessary. Then, click RUN button to start converting VIDEO_TS to AVI. • Hardware accelerator (Intel or NVIDIA according to your graphic cards) has been enabled. If you need a fast conversion speed, keep it turned on. • You’re suggested to tick Safe Mode option if you are trying to convert an encrypted VIDEO_TS folder in case interruptions during conversion. • Disclaimer: Digiarty Software does not advocate ripping copy-protected DVDs for any commercial purpose and suggests referring to the DVD copyright laws in your countries before doing so. Brilliant and exotic foreign films are appealed to cinephiles. Regular release of lots of foreign films is seemingly uncommon but it is easy to get them on DVD discs through online shopping. The only trouble is region code which is employed by DVDs to only allow owners to play discs on a DVD player that has the same region code. What you should do to play a foreign film on disc is to change DVD region code. What Is DVD Region Code? Commercial DVDs sold in a specific area are given a region code to lock discs from playback in other regions in order to control the release of DVDs all over the world. At present, there are 8 region codes in use. 1-6 are divided according to geographic regions while 7-8 are additional for special purposes. Almost all DVD movies use region 1-6 codes. • Region Code 7: Reserved for future use. • Region Code 8: International venues such as aircraft, spacecraft. How to Change DVD Region Code in Windows/Mac? Both PC and Mac offer an option to change region code of DVD drive making it have a matching code with DVD. It makes easy to watch a foreign movie DVD on computer. Now, let’s follow the guides to change region code on DVD disc in Windows and Mac. • Open File Explorer and find DVD drive. • Right-click the DVD drive and move to Properties. • Click Hardware tab and select the DVD drive. Hit Properties button in Device Properties panel. • Click DVD Region tab and choose a geographic area. Click OK. The region code of DVD drive on Mac will be automatically set as the DVD you play at the first time. Once you insert a DVD with a region code which doesn’t match the current region code of DVD drive, it will ask you whether you want to change the region code. Both Windows and Mac have a limited number – 5 – of DVD region code changes. After you have reached the maximum change, the region code will be kept as the last code you set even if you reinstall operation system. It is highly suggested to remove region code from DVD for playback on any device without any limit with the best free DVD region code killer – WinX DVD Ripper. WinX DVD Ripper is free DVD ripping software designed to convert a DVD disc to digital file in MP4, WMV, FLV, MOV etc, in a few of clicks. Compared with some other free DVD rippers which can only handle unprotected DVDs, it empowers users to bypass common copy protections on discs, including region code, RCE, CSS, Sony ArccOS and so on. No matter which region code the DVD use, it can make a digital copy accepted by any player and device. The other highlight of WinX DVD Ripper is its fast ripping speed. Only a couple of minutes (depending on your computer configuration), it can convert region-locked DVD to a digital file with region-free. WinX DVD Ripper is a totally safe and clean program bundled no adware, virus or other malicious software. Download and install WinX DVD Ripper on your computer. Next, follow the steps to remove region code from DVD. Step 1. Insert the DVD disc locked by region code into DVD drive. Launch WinX DVD Ripper and click DVD Disc button. A dialogue box appears asking you to select disc. Generally, the disc will be automatically detected and checked. After the disc is selected, click OK.
DVD content will be fully imported including titles, audio tracks and subtitle tracks in seconds. WinX DVD Ripper will select main title for later ripping. Otherwise, choose any other title according to your need. You can also select desired audio and subtitle track. Step 2. Select an output format by clicking “to MP4” or other tabs. Audio and Video Setting panels appear. You are allowed to change audio quality, sample rate, volume and video quality, frame rate, aspect ratio and resolution to achieve better playback effect on player or device. Step 3. Click Browse button to set an output folder and hit Start button to convert DVD with removal of region code. • Disclaimer: Digiarty Software does not advocate ripping copy-protected DVDs for any commercial purpose and suggests referring to DVD copyright laws in your countries before doing so. Ripping movies from DVD is an increasing demand nowadays. DVD collectors need digital copies of DVDs to better preserve movie content on hard drive. Someone who has a movie on DVD requires putting it in portable devices for watching wherever. Honestly, it is not a hard task to rip movie from a DVD. Various programs in the market are announced as worthy solver to extract movie files from DVD in a breeze. What is the best DVD movie ripper? How to rip movies from DVD? We will lead you to get satisfied answers. Some free DVD rippers have gained popularity to transcode DVD to digital files, e.g. HandBrake, which indeed offers available solution to rip movies from DVD while has obvious defect of unable to circumvent copy protections on DVD by itself. As a matter of fact, DVD distributors always employ stubborn schemes to encrypt DVDs (especially for movies on DVD) from reproducing for copyright reason. Therefore, you’d better choose a more powerful program which is able to copy protected DVDs. WinX DVD Ripper Platinum is our recommendation. It is an expert to support a large range of DVDs, from old scratched discs to newly released movies, with removal of CSS, region code, Sony ArccOS, Disney DRM and other encryptions. Built in 350+ video/audio codecs, it can rip movies form DVD to MP4, H.264, AVI, MOV, FLV, 3GP and other mainstream format with ease. It offers plenty of presets embracing virtually all popular devices, iPhone, iPad, Apple TV, Samsung, Huawei, Surface Pro/Book, Xbox, PS3/4 etc, with precisely calculated parameters fully fitting with video playback specs of various mobiles. This best DVD movie ripper also concentrates a lot on quality and speed. High Quality and De-interlacing Engines can greatly optimize quality of resulting file to output vivid graphics and hi-fi audios. And, video audio not syncing problem will never happen. Taking full advantage of Hardware Acceleration (Intel QSV/Nvidia NVENC), plus Super Encode Engine, Hyper-threading tech, it shows an extremely fast speed to rip movies from DVD, about 10 minutes to convert a 2 hour movie (depending on DVD drive and computer configuration). WinX DVD Ripper Platinum is compatible with Windows 10 (32&64 bit) and lower version. It also arrives with a Mac version enabling you to rip movies from DVD on macOS High Sierra and lower. At the beginning, please download and install matched version on your computer. Next, follow the guide to rip movies from DVD. Insert the DVD movie disc into DVD drive. Launch WinX DVD Ripper Platinum and click DVD Disc button. The dialogue box appears asking you to select source DVD disc. Do it and click OK.
• Generally, the source DVD will be automatically detected if there is only one DVD in optical drive. • There are some options of DVD Disc File Format Type. If you have no idea of the type, keep the default option: Auto Detect. Seconds later, all titles of the DVD movie will be loaded with checked main title. Meanwhile, Output Profile window appears. Move to General Profiles category and select MP4 Video (codec: h264+aac). Click OK. There are several other categories provided, device profile, web video profile, DVD backup profile, to music and more. You can select any format or device model under corresponding category as output format according to your needs. If necessary, click Browse button to define a new folder to save the ripped movie file. Then, click RUN button to start DVD ripping. Tip: You’re suggested to tick Safe Mode option if you have a newly released DVD movie to convert the DVD more successfully. After the process is finished, destination folder saving the extracted movie file will be opened. You can play it immediately or transfer to iPhone, iPad, Android for flexible playback. Hundreds of DVD discs are full of the shelf, drawers or boxes. It’s your DVD library collecting lots of previous movies, from classic to new hit. However, not all discs are in a great condition but covered with dust, small scratches and other hurts which result in DVD player can’t access the contents. To revive the huge DVD collection, especially for some hard-to-find movies, disc to digital conversion is an advisable choice. A digital copy with full video, audio, subtitle tracks can be better stored on hard drive, other storage device/cloud and enjoyed on mobiles whenever wherever. How to rip a DVD disc to digital free? One of 3 ways listed here may be your pick. 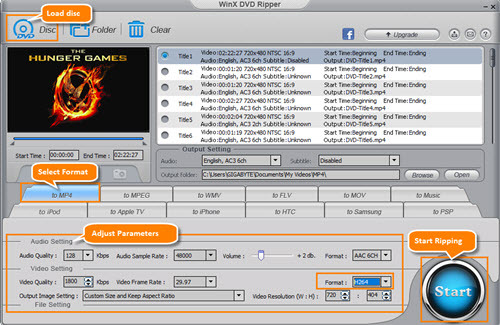 WinX DVD Ripper is packed with the ability to convert a DVD disc to digital with ease. It can handle a wide range of discs, from homemade to commercial, from old damaged to new encrypted by removing current protection on DVDs. It gives several output options allowing you to turn the disc into MP4/H.264, WMV, MOV, FLV, MPEG or a file accepted by iPhone, Apple TV, Android and PSP. Whatever format you select, this disc to digital program will deliver the possible highest speed and quality. Step 1. Download and install WinX DVD Ripper on your computer. Step 2. Insert the DVD disc into your computer DVD drive. Launch WinX DVD Ripper. Click DVD Disc button. A smaller window pops up asking you to select disc. Generally, if there is only one disc in the drive, it will be automatically detected. Then, click OK. Step 3. All titles are loaded soon. Main title is selected by default. Now, select an output format. For example, if you want to rip DVD disc to a MP4 digital file, click to MP4 tab. Audio/Video Setting panel appears. Adjust those parameters as you like or keep default. Step 4. Click Start button to get the disc ripped. HandBrake is actually one of the most popular open source video transcoders. Both DVD discs and digital video files can be converted to MP4 or MKV. Through continuous update, HandBrake gives many improvements on supported codecs and technologies in order to meet more requirements on profiles and ripping speed. HandBrake lacks of the function to rip copy-protected DVDs unless installing libdvdcss which can help circumvent CSS scheme on DVD. Step 1. Download and install HandBrake on your computer. Step 2: Insert DVD disc into DVD drive. Open HandBrake and a source selection panel on the left side appears. Click the disc on this panel. Otherwise, click Open Source button to load the source disc. Step 3: The source DVD disc info will be loaded with Title/Angle/Chapter/Duration. Next, go to Destination section and click Browse button to define output folder to the name of resulting file. Note: HandBrake may select wrong main title. If so, please manually choose the right one. Step 4. Select Container as MP4 or MKV depending on your needs. There is a setting section allowing you to adjust resolution/aspect ratio, video codec/framerate, audio/subtitle tracks or other parameters. Step 5. Click Start Encode to rip this DVD disc to digital. MakeMKV is another disc to digital program which can transcode video clips from DVD or Blu-ray disc to MKV files. With MakeMKV, virtually all information without any change of source disc can be perfectly maintained, including video/audio tracks, chapter, meta and more. MakeMKV offers a beta version with 30-day free trial. And, you can choose to buy a key for full version when exceeding the trail time or re-down beta version for another 30-day free use. Step 1. Download and install MakeMKV on your computer. Step 2. Insert the disc into DVD drive. Launch MakeMKV. Click File > open disc or the movie icon located on the left first under menu bar to load the disc. Step 3. 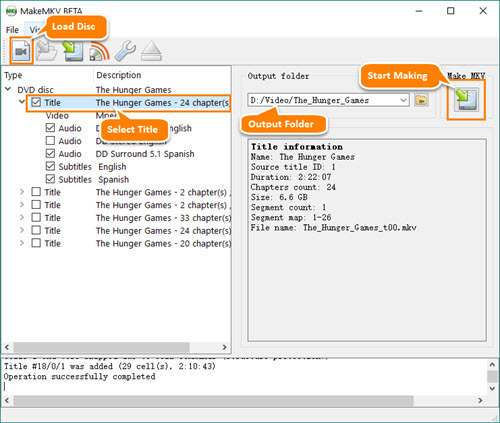 MakeMKV will read the disc and then display the contents including video, audio and subtitle contained in one title. Note: If there are several titles listed, you may need to judge which title is correct main title and uncheck other titles. Step 4. Set an output folder to save ripped digital file. Step 5. Click Make MKV button next to output folder panel to start making the disc to a MKV digital file. How to Fast Rip DVD Dunkirk to MP4, AVI, WMV, MOV etc. Dunkirk, a Christopher Nolan film in 2017, was highly praised in many aspects from direction, film editing to music. It received 8 nominations at Oscar 2018 and eventually won 3 awards, incl. Best Film Editing, Best Sound Editing and Best Sound Mixing. Although it’s a regret that Dunkirk wasn’t awarded as the Best Picture which went to The Shape of Water, it is an amazing film worth your watching. Every of you can enjoy Dunkirk on DVD even though you missed it in cinema. You also have a chance to watch Dunkirk on mobiles by digitalizing the DVD. Here, we will introduce a solution helping you rip DVD Dunkirk quickly and easily. DVD ripping software is a good helper which enables you to convert or copy a DVD with ease. But not all DVD rippers can handle Dunkirk DVD because of copy protection. Some big names (HandBrake, VLC) fail to digitalize this DVD movie. Is there an available program which can rip copy-protected DVD? WinX DVD Ripper Platinum focuses on offering the most efficient solution to rip DVD to digital. It supports a large range of DVDs, from home-made to commercial. It is available to remove copy protection from DVD movies (Dunkirk included), TV shows, 99-title DVDs, workout DVDs and more. Built-in 350+ video/audio codecs and device profiles, it can easily rip Dunkirk DVD to MP4 (H.264), AVI, WMV, MOV, FLV, 3GP, iPhone, iPad, Android, Windows Mobile, Xbox, PS3/4 etc. It also offers copy modes helping you 1:1 clone DVD to ISO Image, VIDEO_TS folder or back up main/full title as a single MPEG2 file. Taking full advantage of High Quality Engine and De-interlacing Engine, you can get an output file with vivid images and hi-fi audio ripped from Dunkirk DVD. What’s more, Super Encode Engine, Multi-core Utility and Hardware Encoders (Intel QSV, Nivdia NVENC) can greatly accelerate DVD ripping speed. How to Rip DVD Dunkirk with WinX DVD Ripper Platinum? Beyond everything, you should download and install WinX DVD Ripper Platinum on computer. The Windows version is available for Windows 10 or lower and Mac version for macOS High Sierra or lower. This guide shows how to rip DVD Dunkirk to MP4 on Windows 10. Mac user guide shares the same workflow. Insert Dunkirk DVD into DVD drive. Launch WinX DVD Ripper Platinum and click DVD Disc button. A dialogue box appears asking you to select the source DVD disc. Generally, the DVD will be automatically detected and selected. Click OK.
All titles of this DVD will be loaded soon. Main title is auto-checked. Meanwhile, Output Profile window pops up. On the left side, categories are listed. Go to General Profiles > MP4 Video (codec: h264+aac) > OK. If necessary, click Browse button to set a new destination folder. At last, click RUN button to start ripping. After the process is completed, destination folder which saves the ripped file will pop up. You can play it later or transfer the video file to iPhone, iPad, Android for watching on the move.